Louisville Carpet and Upholstery Fiber Protector. In the Carpet cleaning industry there is a lot of confusion about procedures and Methods. Also the application of protector on carpet and Furniture brings a lot of confusion too. Uneducated and uniformed carpet cleaners cause a great deal of confusion by giving out false information or intentionally misrepresenting the product. Carpet and Fiber Protector works great if its applied properly. A nylon stain-resist carpet is made with two protective properties. The first is an acid dye blocker that is basically a clear that fills the extra dye sites in the fiber. This application helps to prevent foreign dyes such as red dyes(cool-aid) from penetrating the carpet fiber. The second property is “flourochemical”. It is commonly known as Scotchgard. This treatment helps keeping spillage from getting to the acid dye blocker and also resist dry soil. 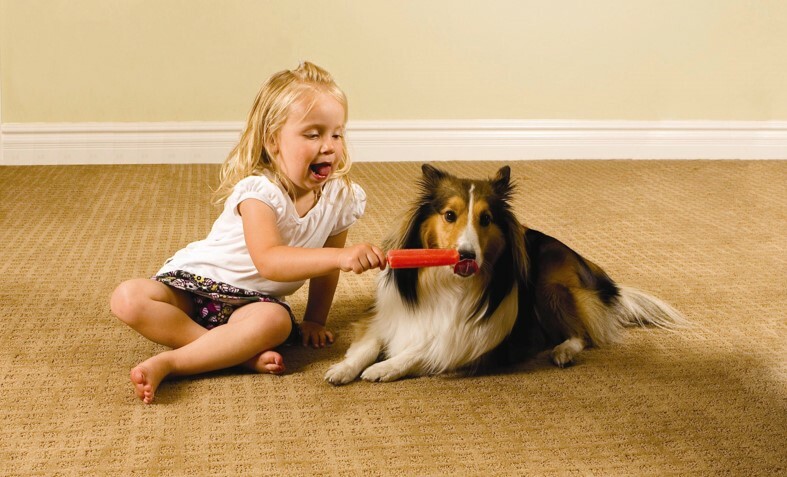 Dry soil in your carpet works like sandpaper on your traffic areas. Once the traffic area yarns are broken down, there is no way to bring them back to their original state. By having a protector that resist dry soil your carpet will last longer, less soil bonds to the carpet, therefore being picked up by your vacuum or cleaning will help. Also making sure that you have sufficient amount of protector on your carpet will help keep the soil from bonding to the carpet. Deep, Penetrating Stain Resistance: Maxim Advanced prevents staining from food dyes such as those found in children’s red fruit drinks. Normal use of your carpet will eventually wear off much of the mill applied protective treatment. No protector is permanent. Primary Ways that factory protector is removed from your carpet. Everyday foot traffic. Over a period of 6 months to 2 years depending on the traffic , a significant amount of protector can be removed from your carpet and needs to be reapplied. Harsh cleaning and spotting agents. Uneducated and sometimes downright unscrupulous carpet cleaners use harsh chemicals on the carpet that will strip it’s protection. Deodorizing and disinfecting sprays. Sometimes home owners buy discounted products that has harsh chemicals on it . MAXIM Advanced carpet protector will help your carpet stay cleaner and stain-free longer. Each time your carpet is professionally cleaned, reapply protector to prolong the life and your enjoyment of this valuable investment. Makes spot and spill clean-up easier and painless.The easier a spot is to remove, the less cleaner you will have to use. The less agitation you will have to use, and the less time it will take. Many spots can be removed easily with just water. Your carpet will last longer. It reduces carpet wear, especially in high traffic areas.Traffic area soil is very abrasive and cuts carpet yarns like a knife. This damaging soil can easily bond to an unprotected carpet. By applying protector, you will increase the life of your carpet dramatically. When you vacuum your protected carpet the soils will release from the carpet pile much more effectively. 3. Makes subsequent vacuuming faster, easier, and more efficient. The dirt and the unpredictable spell won’t stick to the carpet as they usually do, which will allow you to vacuuming easier. 5.Makes your next professional cleaning more effective. Having protector applied to your carpet will enhance your next cleaning. More soil will be removed the next time your carpeting is professionally cleaned. 6.Helps avoid costly service calls. Although you want to call us to handle any spot you cannot remove immediately, carpet protector helps you remove more spots than you could without protector. You may be able to save a minimum charge by removing the spot yourself. Why our company applies MAXIM Advanced Protector ?